Preheat oven to 375 degrees F (190 degrees C). Line two baking sheets with parchment paper, or lightly butter or spray with a non stick cooking spray. In the bowl of your electric mixer (or with a hand mixer), beat the butter until smooth. Add the sugars and beat until smooth and creamy (about two minutes). Add the eggs, vanilla extract, and corn syrup, and beat until well combined. Scrape down the sides of the bowl as needed. In a separate bowl, whisk together the flour, baking soda, salt, and ground coffee. Add the flour mixture to the creamed mixture and beat just until incorporated. Stir in the oats and chocolate chips, and then gently stir in the rice cereal. If the batter is soft, cover and refrigerate until firm (about one hour). For large cookies, take a scant 1/4 cup (60 ml) of batter (I use an ice cream scoop), and place the cookies about 2 inches (5 cm) apart on the baking sheet. Flatten the cookies slightly with your fingers so they are about 1/2 inch (1.25 cm) thick. Bake the cookies for about 10 - 13 minutes or until golden brown around the edges but still soft in the centers. For chewy cookies, slightly underbake. 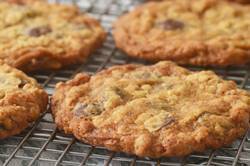 For crunchy cookies, bake a few minutes longer. Remove from oven and let the cookies cool a few minutes on the baking sheet before transferring them to a wire rack to finish cooling. Can be stored in an airtight container for 3-4 days or they can be frozen.